There is a number of things you can do to see where the problem is. First you will need to check your Flight Simulator directory if the files have installed. This should not be too difficult as we will list the default installation paths to the flight simulators we support below. Please note that this is the default install directory and that it may have been changed when you installed your Flight Simulator. 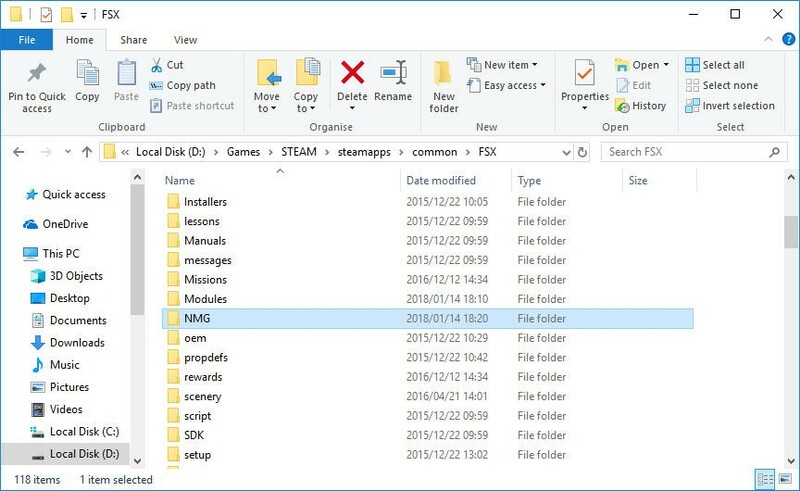 Open your Windows File Explorer and then browse to your Flight Simulator Install Directory as above. Now look for a directory called NMG. In here you will find all the airports you have bought from us, arranged by their ICAO codes. We are going to use Wonderboom airport as an example which ICAO code is FAWB. 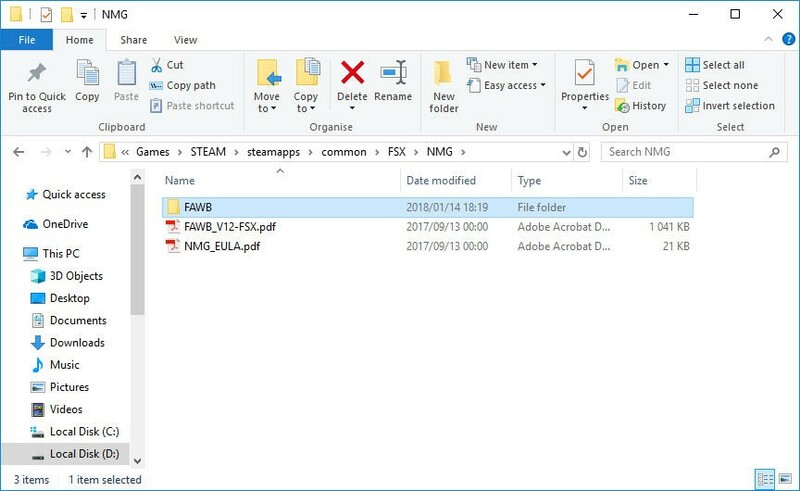 You will see the FAWB directory and inside this directory you will find two more directories named SCENERY and TEXTURE. You will find the files that make the airport work in these two directories. If you do not, then it means that the airport did not install correctly and that we will need to see what went wrong. Please uninstall the airport package if this is the case. If however you can see the scenery files installed, then please proceed to the Scenery Library section. Run the installer again and proceed with the installation until you see the screen above. This will be the last screen before the file will start to copy. Make a note of the location where the installer think your Flight Simulator package is installed into. 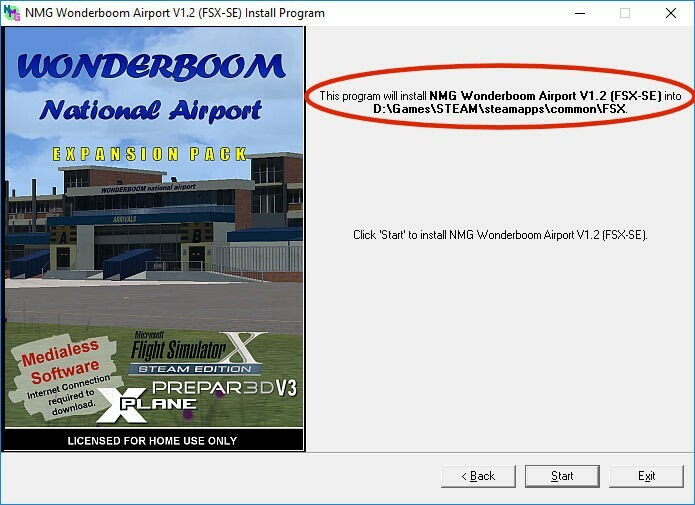 If it does not show the correct path or if the installer cannot find where your Flight Simulator is installed, it will show a temp directory there. To fix that is easy. Please download our Flight Simulator Registry Fixer from the DOWNLOADS / FREE FILES tab of our website and run it to fix your Windows Registry. The last step to follow is to go into your Flight Simulator Scenery Library and to make sure that there is an entry to your airport scenery there. We have found that in some rare cases, the installer does not add the scenery as it should. Please follow our instructions under our Support Knowledge Base on How to add scenery into FSX & FSX Steam Edition. These instructions may be for FSX and FSX Steam, but there are also relevant to Prepar3D. We have also find that 99% of people never read the document file that we distribute with our scenery packages. They therefore do not know that when they uninstall scenery that the must manually remove the entry from the Scenery Library. Our installer will add scenery into the Scenery Library, but it will not remove it. The result is that you may end up with multiple entries for your airport package and that will cause your Flight Simulator to get confused and not to display the scenery correctly. We have found that in some rare cases, the uninstaller can completely wipe your Scenery Library clean when you uninstall our scenery and that is why we no longer remove the scenery entries from the Scenery Library. Damaging someone’s Flight Simulator and forcing them to add hundreds of scenery packages again is not fun! By following these instructions, we are sure that you will be able to solve most of the problems, but please note that you can only have one specific airport package installed at any one time. Our airport packages do not auto-upgrade from one version to the next. You will need to remove any previous package before you install and upgraded version and remember to remove those entries in the Scenery Library. If you have scenery installed in the same area as the airport, then there is a very big chance that that scenery may interfere with our package. We try to minimize these interferences, but they do happen. It is impossible for us to predict what addons and utilities you may have installed. We will try our best to help you, but you may need to go to the companies who’s addon you have have installed for help.